It’s been some time since Marian Goodman has hosted solo exhibitions in New York by Dan Graham, Giuseppe Penone, Danh Vo or Jeff Wall, and the gallery seems to have noticed, opening a four-artist show with a considerable amount of new work from each of the aforementioned, offering a welcome opportunity to catch up on the recent work of these significant artists. The gallery’s first room features two new large-scale works from Jeff Wall, alongside a smaller picture, Flowering Plant, from 2012. 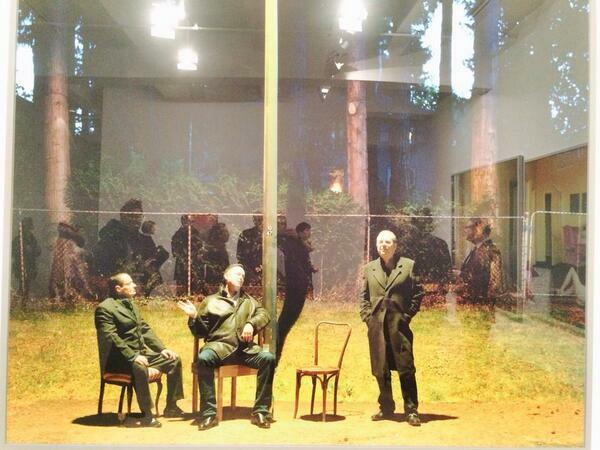 The first of these new pieces, Monologue (2013), depicts three men in Wall’s idiosyncratic, cinematic style; conversing at night under a streetlight. Nearby, Summer Afternoons (2013), a diptych, features two people reclining naked in a sun-filled, yellow-walled apartment. This latter work is notable for its striking sense of color and its aloof atmosphere of unease. Another room contains a series of works by Giuseppe Penone, a figure associated with Arte Povera and who facilitated key developments in sculpture in the 1960s and 70s. 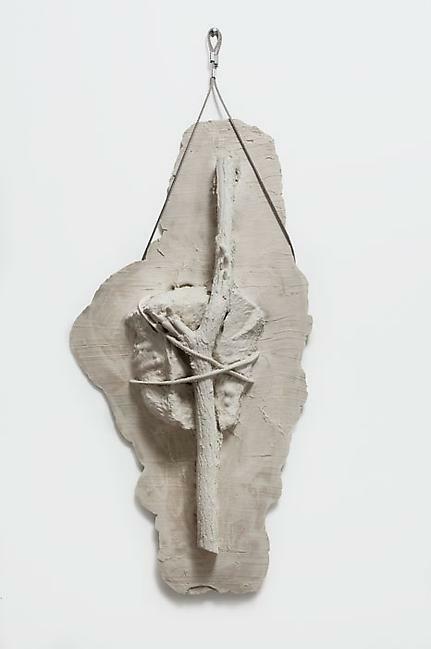 Penone’s practice has long been concerned with establishing traces and connections between different entities, and the series of six wall-mounted sculptures exhibited here, ‘Germinazione’ (2005), further elaborates on these concerns. Formed by the artist taking a section of a tree and pushing it into earth, the resin sculptures bear the imprint of the wood as well as traces of the artist’s own hand, the resultant objects blurring the distinctions between process and material, humanity and the natural world. Danh Vo presents a work that was shown for the first time last summer at Art Basel’s Parcours: Gustav’s Wing (2013), a series of six cast-bronze fragments based on Vo’s 11-year old nephew Gustav. 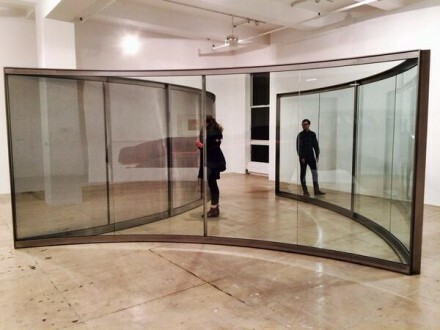 Installed in the gallery’s window-less Viewing Room, these fragments are dispersed around the space—some hang from the ceiling, while others rest lopsided on the floor. 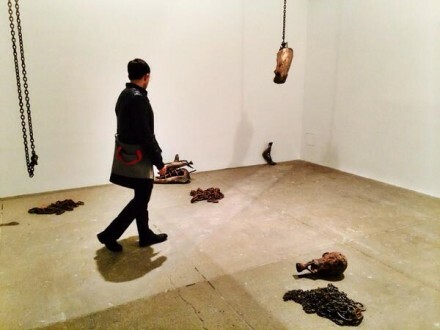 Interspersed with chains sitting coiled on the ground, the work has a morbid, effect produced by the seeming carelessness with which it is arranged. 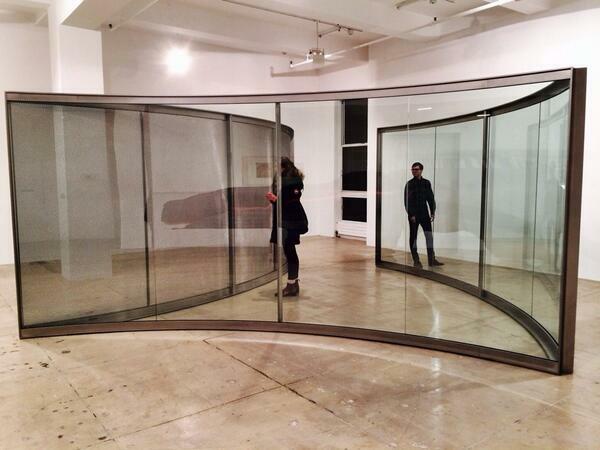 Set apart from the other rooms, the South Gallery presents a new pavilion work by Dan Graham. Slice (2013) continues Graham’s exploration of the pavilion form, which has been an ongoing concern of the artist for over 30 years. 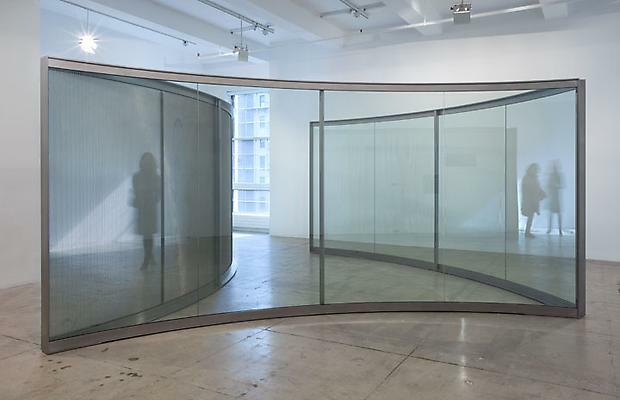 Adopting two-way mirror glass of the kind used to fabricate office buildings, these works borrow the vernacular of corporate architecture, using it as a means to challenge the viewer’s sense of perception and boundaries. 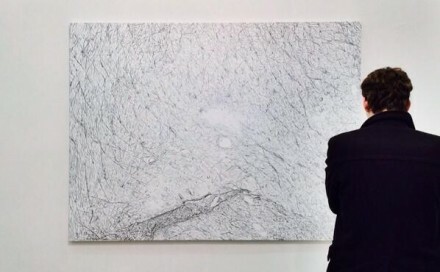 Here, Graham has installed two pieces of glass, one concave and one convex, which alongside a convex piece of perforated stainless steel, produces perceptual gaps and anomalies that steadfastly resist resolution. The four-artist show closes on April 12th. This entry was posted on Friday, April 11th, 2014 at 12:00 am	and is filed under Art News. You can follow any responses to this entry through the RSS 2.0 feed. You can leave a response, or trackback from your own site.